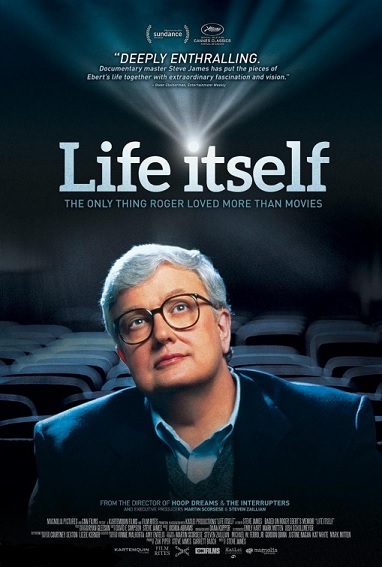 This is a difficult movie to watch because it’s more about Roger Ebert, the very sick man, than it’s about Roger Ebert, the very popular movie critic. For continuity, it’s uses lots of sequences from his stay in the hospital and in the rehabilitation clinic when he lost his jaw and was steadily losing his life. The man we want to remember as so full of passion for the movies…is too often shown as supported by tubes, surrounded by caregivers and slipping slowly and smilingly into death. This doesn’t feel like way we want to remember him, but it seems like the movie he wanted made. At one point, he’s very clear with the documentarian, Steve James, who made this film – all this needs to be shown. But enough already! When someone this sick keeps giving the “thumbs up,” it feels like a shadow of the man is making a parody of the sign he made famous. It feels like a lie. We came to the theatre to learn more about the man we thought we knew from his brilliant and sometimes biting reviews of the thousands of films he saw – and we get someone else. How did he develop this passion for the movies? How did he know so much about them? How did he watch a movie when he was doing a review? How did he write his review? How did he decide what he would say on air – and how did Gene and he prepare for their wonderful “Sunday night debates?” The movie answers none of those questions. It doesn’t take us places we want to go; it keeps taking us back to his hospital room. It may be brutally honest, but it’s not really entertaining. We get the story of an old and very sick man; we just never feel the full genius of his magic.